You are here: Home > mi-News > Feeding Made Simple – Part 3. Feeding Made Simple – Part 3. 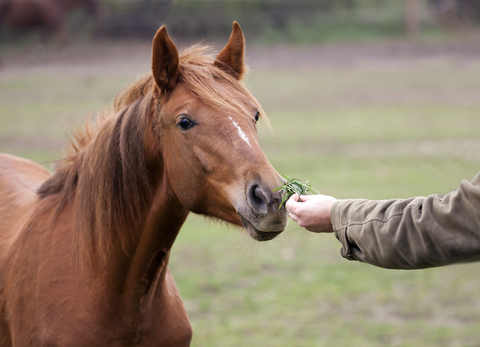 Our first two articles have concentrated on the basics of horse management. We are now able to briefly introduce the horse feeds manufactured by Mi-Feed. These feeds are available through our produce agents or in bulk from our mill in Yandina. In conjunction with leading Equine nutritionists we have formulated eleven horse feeds. Each feed is designed for a specific purpose. We manufacture Micronised sweet (grain based) feeds as well as pellets. When selecting a product for your horse look first for the energy level contained in the feed. Horses fed mixes too high in energy may put on excess weight and if not worked may present as over sensitive. When this situation occurs either the exercise level must increase or the feed regime must change to a higher fibre and lower energy component. In short the amount and type of feed used should match the condition and work level of the horse. Protein levels should be geared for the age and stage of your horse. Growing horses and breeding horses have higher protein requirements than mature age horses. Excess protein and deficient fibre may lead to problems with digestion, legs and feet, and behaviour. Remember when changing to lower energy feeds the mix must still be balanced nutritionally. Unless an individual has sound nutritional knowledge on horse feeds it is perhaps better to let the professionals advise you. Because of our stand on the use of chaff as an effective fibre source our feeds have been designed to be fed as a concentrate and complimented with adequate levels of hay. However it must be understood that we are not opposed to chaff being included in a feed for the purposes of adding bulk dry matter to the feed. As a genuine ‘Cool’ feed ( 10.8Mj/Kg ) Easy Rider is a perfect mix for the horse or pony who is inclined to become excited or is a genuine ‘Good Doer’ and only needs a low energy feed to maintain good condition. The grains in this product are micronised to improve the efficiency of the feed. Energy level ( 11.58mj/Kg )is still low enough not to pose a problem for horses in light to moderate work. Roasted horse flakes are the ideal feed for pleasure and recreational horses. It is also an ideal ‘spelling’ feed for racing and sport horses. This mix has been scientifically formulated to meet the needs of mares, foals, and young growing horses. 15.5% protein, 12.5mj/Kg, additional lysine and our Performance Pre mix ensures that these horses get the very best nutritional help. This feed has been very successful at putting condition on older horses and horses in poor health. Using micronised grains and our Performance Pre mix this concentrate has been formulated for horses in high levels of work. Because of the richness of this feed the inclusion of adequate hay into the diet is very important. Protein is set for mature horses and energy has been geared to provide fuel for horses in full daily work. Achieving optimum condition in all horses is important. Mi-Feed Bulk Up is designed to encourage weight gain and improve muscle tone. Bulk Up is a safe feed for horses straight off the track. Horses on Bulk Up can be kept on Bulk Up during both conditioning and maintenance periods. An alternative to pellets but still economical. Mi-Feed Horse Muesli is an economical grain based feed which will keep your mature horses in top condition weather they are in work or spelling in the paddock. With age nutritional requirements of horses change along with their ability to digest protein, fibre, minerals and vitamins. Mi-Feed Old Mate is designed to meet these unique requirements by providing horses with quality protein, cool energy and a full range of macro minerals and essential vitamins. Micronised Barley – Barley that has been steam treated, micronised and flaked which improves the digestibility of the grains. Barley can be added to provide energy in an animal’s diet. Barley is suitable to all animals. Not a complete feed and should be fed in conjunction with a specialised feed or with a vitamin and mineral supplement. Nutrition plays a key role in ensuring horses perform to their full potential. Mi-Feed Winners Edge is an oat free, high energy feed which will fuel horses to the finish line. Levels of essential vitamins and minerals are elevated in Winners Edge to ensure the elevated requirements of racing horses are met.